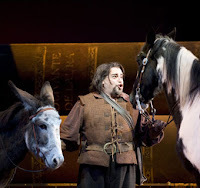 Seattle Opera Blog: QUIXOTE'S (and Sancho's) QUEST - Week 4 Clues! QUIXOTE'S (and Sancho's) QUEST - Week 4 Clues! Whoa, good job, guys! The final necklace has just been found, at the University Village Barnes & Noble. A giant windmill-sized thank you to everyone who participated in these hunts. We had a blast, and we hope you did, too! We're on our final week of "Quixote's Quest," and Sancho Panza has been swayed by Don Quixote's adventurous spirit, and now demands a quest of his own! So, in honor of him--and in honor of opening our production this past weekend--we're giving you two chances to win tickets to the March 9 performance of Don Quixote. We've hidden two different necklaces somewhere in the Seattle area, and we'll be posting clues for each every day this week, until they've been found. Before you head out on the hunt, make sure to read the full details and rules here. CLUE #1: Bunyan’s pilgrim labored through the ___ of Despond; DQ’s foe overlooks this one, of Sammamish. 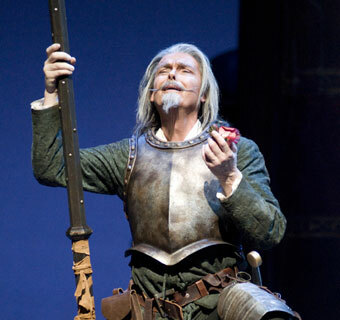 Nicolas Cavallier as Don Quixote. Photo by Rozarii Lynch. CLUE #1: In a village known for apples and anthropology, cupcakes and candy, Don Quixote’s adventures live on. Eduardo Chama as Sancho Panza. Photo by Rozarii Lynch. Be the first one to retrieve either of the hidden necklaces (but not both! Only one prize package per contestant), and you'll win two tickets to the March 9 performance of Don Quixote. If you need more help, fear not. Just come back to this blog every morning this week (or check out our Facebook or Twitter pages) for NEW CLUES every day until the necklace has been found.